One of France’s busiest airports, Lyon-Saint Exupéry Airport serves the city of Lyon and the surrounding Rhône-Alpes region. For information on airport facilities, nearby accommodation and public transport options, take a look at our Lyon-Saint Exupéry Airport guide. An extension was added to Terminal 3 in 2011 for low-cost airline services. There are three help desks at Lyon-Saint Exupéry Airport: in the departures area of Terminal 2, arrivals area of Terminal 1 and in the central hall. Lyon-Saint Exupéry Airport is located on the A432. From Lyon, the airport can be accessed via the A43 eastbound (in the direction of Chambéry). The three terminals are adjacent and within walking distance of each other. 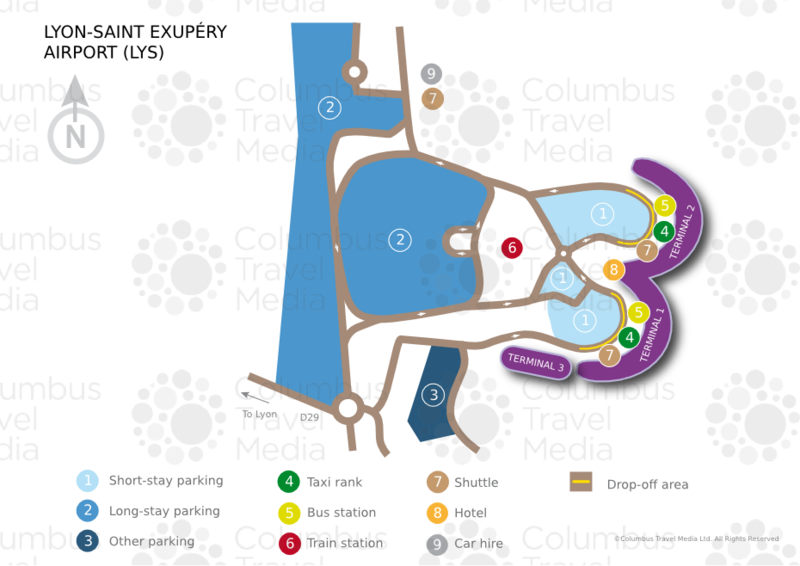 A free shuttle bus also links the terminals and the long-stay car parks. Lyon-Saint Exupéry Airport is situated 20km (13 miles) east of Lyon's city centre. Bus: Buses and coaches operate to a number of destinations in the Rhône-Alpes region; including Annecy, Aix-les-Bains, Chambéry and Grenoble. Shuttle: Several shuttle bus services connect Lyon-Saint Exupéry Airport to a number of mountain resorts and cities in the Rhône-Alpes region. Ticketing desks are located in the central area. Taxi: A taxi rank is located in front of Terminal 1. Taxis operate 24 hours a day, seven days a week. The fare into central Lyon ranges from €45 to €60 (depending on time of day) and the travel time is about 25 to 30 minutes. Rail: Trains run daily services from the airport’s TGV station to 15 cities in France and northern Italy; including Paris, Marseille, Avignon, Turin and Milan. Contact SNCF (tel: 36 35; www.sncf.com) for further train information. Tram: The Rhônexpress tram service (tel: 04 7975 9279; www.rhonexpress.fr) connects the airport directly with the city centre in less than 30 minutes. The single fare is €15.70 (or €14.50 when pre-ordered online). Trams run every 15 minutes, except 0500 to 0600 and 2100 to 0040 when they run every 30 minutes. A bureau de change kiosk is located in the central hall (known as The Square) between Terminals 1 and 2 – there is also an automatic currency exchange machine in Terminal 1. ATMs can be found throughout the airport. Numerous restaurants, bars and cafés are located in Terminals 1 and 2 and in the central hall. These include a brasserie restaurant and a bar specialising in beer in the central hall and cafés in the public area of Terminal 2. More limited options are available in Terminal 3; these include a snack bar. Shops at Lyon-Saint Exupéry Airport include a newsagents, bookshop, toy retailer, jewellers, clothes outlet and a shop selling regional produce. There are duty-free outlets in Terminals 1 and 2. Luggage trolleys can be used for a €1 deposit. For lost and found items, enquire at the main information point in the central hall or contact the relevant airline (a list of contacts is available on the airport’s website). Other facilities include a left luggage service and porters. A chemist and a 24-hour medical are located in the central hall. There is also an interfaith chapel in the central hall. Mother and baby rooms are situated in all terminals. Showers are also available. The airport business centre (tel: 04 7222 8374) has several meeting rooms accommodating between two and 80 delegates, each equipped with telephones, paperboards and Wi-Fi internet access. The area also offers audiovisual equipment, secretarial services (typing, interpreting, fax, photocopy and printing) and catering facilities. Fax and photocopying services are available at the main information point in the central hall, opposite the post office. Wi-Fi internet is accessible in all public areas. Among the in-terminal facilities are telephone kiosks and toilets that are accessible to wheelchair users. Staff members are on hand to assist passengers within the terminals. Disabled passengers are advised to contact their airline directly for assistance with boarding prior to travel and to report to the check-in desk on arrival. There is a set-down point in front of Terminal 1 and reserved spaces in front of the train station in car park P6, as well as at the other short-term car parks P0, P1 and P2. A discount on parking charges is possible on presentation of a valid disabled badge to the car park information desk in the central hall. There are several parking options at Lyon-Saint Exupéry Airport. The underground P0 car park offers short-term parking with direct lift access to the terminals; P1 and P2 car parks are also short-term and serve Terminal 1 and Terminal 2 respectively; while P5 and P6 are long-term car parks connected to the airport terminals by a free shuttle bus. The first 20 minutes of parking are free. Advance reservation is available; bookings should be made via the airport website. Car hire companies represented at Lyon-Saint Exupéry Airport include Avis, Europcar, Hertz, National/Citer and Sixt. Desks for these operators are located in Terminal 1 and free shuttle buses connect to the car hire areas.